Founded in 1880 by Lam Siu-nam (林紹南) and his brothers, Lam Wang Loong is the first glass manufacturer in Hong Kong and operated for many years out of 109 Queen’s Road East in Wanchai. By the 1930s, the firm was managed by Lam Kwai-chuen (林桂泉), a third-generation member of the founding family. 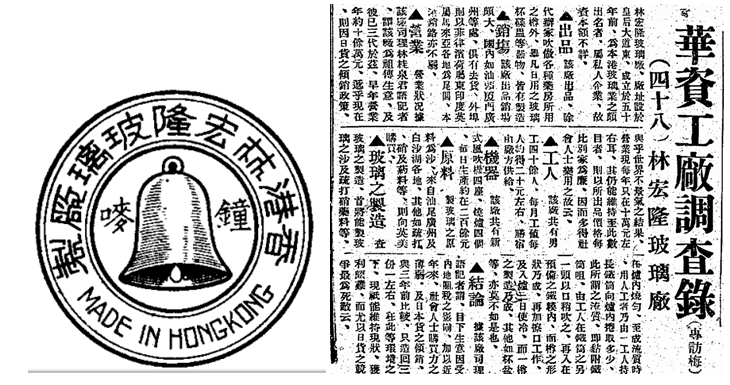 According to a 1934 article, the firm was doing HK$100,000 in sales per year and employed about 40 workers who were earning about HK$20 each monthly. The firm specialized in making glass bottles for pharmacies and also made glassware such as water glass and glass plates. In addition to domestic sales, it also exported its products to Swatow, Amoy and Canton and Southeast Asian markets such as the Philippines, Indonesia and Malaya. The raw materials included sand which came from nearby Guangdong province and sodium and calcium carbonate which were acquired from the US and the UK. In the 1950s and 60s, the firm was managed by Lam Ip-sang, presumably the son of Lam Kwai-chuen. The firm was still around in the late 1970s but its site in Wanchai was redeveloped into Greatmany Centre (智群商業中心) in 1985. Founded in 1924, Kwong Hing Loong operated out of 46 Beech Street in Tai Kok Tsui next to Kwong Tai Loong and its manager was Tong Cheung. Given the proximity of factories, similar names and same surname of its owners, there might be a connection between Kwong Hing Loong and Kwong Tai Loong. 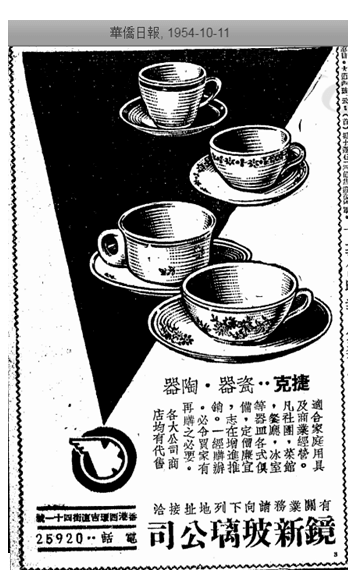 Hip Cheong was founded in 1927 by Leung Chiu (梁朝), who started In the glass business at an early age. During the Japanese occupation, raw materials for glass production were hard to come by and leveraging his technical expertise, Leung made new glass bottles by melting broken glass. The firm operated out of its main factory at 408 Queen’s Road West and had a branch factory at 2-5 Wun Sha Street in Causeway Bay. During the Korean War, glassware was in high demand and Hip Cheong built factory buildings in 362-374 Shau Kei Wan Road to expand production. Aside from domestic sales, Hip Cheong also did a lot of business in Southeast Asia – especially Singapore, Rangoon and Saigon. Hip Lee was founded in 1929, taking over the glass manufacturing operations of the confectionery firm M.Y. San (see related article “Three Kings of Biscuit”). Its factory was located in Shau Kei Wan. There is no record of its activities after the War. Founded in 1936, Tung Hing Glass specialize in glassware but also produces metalware, kerosene lamps and other products. In the 1970s, it was operating out of Pine Street in Tai Kok Tsui near a number of the firms mentioned here but has since relocated its manufacturing operations to Dongguan. 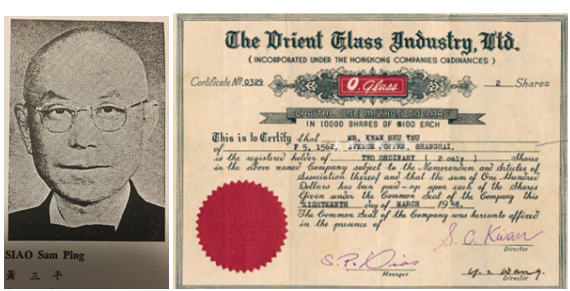 The Orient Glass Industry and Wing Lee Glass Industry were two leading glass manufacturers founded after the War in HK by Shanghainese businessman Siao Sam-ping (蕭三平). Born in 1901, Siao was a native of Nan Wui in Kiangsu province and studied at Sin Kong Commercial College. He also studied in Japan and became fluent in Japanese and during the Japanese occupation of HK, he allegedly served as an interpreter to save people and was awarded three war medals by the British after the war according to his entry in the 1967 HK Album. In 1946, he formed The Orient Glass Industry in Hong Kong with Shanghainese capital. 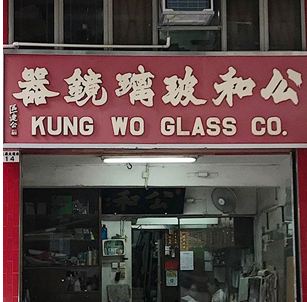 The firm operated out of 27 Whitfield Street in Causeway Bay (not far from Kwong Sang Hong and Corney) and one of its glass engineers Ming Y. Chen was a member of the Society of Glass Technology in the UK. Both Orient and Wing Lee maintained its office in the Ho Tung Building at 176 Queens Road Central. In the 1950s, Wing Lee’s factory was located at Bedford Road in Tai Kok Tsui but by the 1970s, its operations were located in 9 mile, Castle Peak Road and also Chai Wan. As a firm, Orient Glass dissolved in 1961 and Wing Lee Glass was incorporated in 1957 and dissolved in 1978. In addition to Wing Lee and Orient, Siao was involved in Shanghai Yee Shing Printing Press and Sam Fung Printing Co and was supervisor of China Products (HK) Ltd. 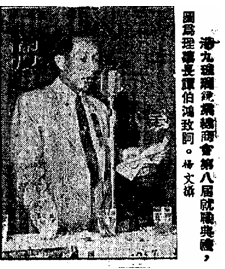 He was very active in community affairs, having served as a director of the Chinese General Chamber of Commerce, the Chinese Manufacturers Association, the Kiangsu Chekiang Residents Association and its schools, the North Point and Causeway Bay Kaifong Welfare Associations and was also the honorary chairman of two soccer leagues – Kwong Wah and Kit Chee Sports Club. Some of his children were also involved in Wing Lee. Founded in 1946, Ngai Sang specialize in manufacturing of plastic and metal framed mirrors. In the 1950s, its plant was located at 242 Main Street in Shau Ki Wan but by the 1960s had moved to 28 Lee Chung Street in Chai Wan. Its manager was Ng Sik-ping. The corporate entity has changed from Ngai Sang Mirror Factory to Ngai Sang Mirror Manufacturers (incorporate in 1982 and dissolved in 1989) to its current form as Ngai Sang Mirror Trading. Tung Wo Hing’s factory was located at 8 Beech Street in Tai Kok Tsui not far from Kwong Tai Loong, Kwong Hing Loong and Tung Hing mentioned above. Little is known about Kan Sun Glass but its founder Tam Pak-hung (譚伯鴻) was known for his longtime involvement with HKGMMMA as its chairman and with the Kennedy Town Kaifong Welfare Association which has its social centre for the elderly named after him. A native of Xinhui, Tam was born in 1896 and was educated in Canton. His involvement with the glass industry began in Canton before he started Kan Sun in the Western district in the 1940s. He was also permanent honorary chairman of the Tam’s Family Association and president of the Lions Rock Lions Club (1979-80) and founding president of the Mt. Cameron Lions Club (1981-82). He remained active well into the 1980s when he was in his eighties. Kowloon Glassware was one of the leading glassware manufacturers in HK. In the 1960s, it was operating out of San Shan Road in Kowloon but by the 1970s, it was operating out of Tong Yan Sun Chuen in Yuen Long. Founded in 1954, HK Marble Glass was the first HK manufacturer to make glass marbles. The firm was started by John Tung of I-Feng Enameling (see article), who spotted the opportunity to make marbles in HK when the British Commonwealth began taxing imported Japanese marbles that dominated the market at the time. 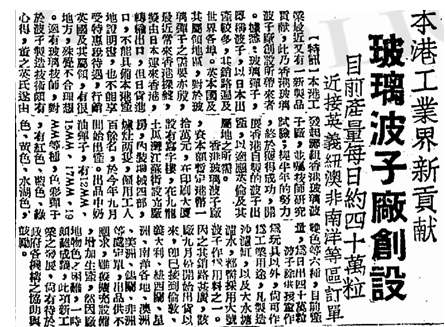 The firm’s office was located at Printing House in Central and its first factory was located at Kiang Su Street in To Kwa Wan. After half a year of R&D, the plant went into production of six different colors of marbles in September 1954 with 100 workers, 2 kilns and 4 machines capable of churning out 400,000 marbles per day. It immediately secured orders from UK, Italy, Australasia, Africa and Southeast Asia and also showcased its products to the local market at the 1955 HK Products Expo. The business thrived for the next two decades and an additional plant in Tuen Mun was added. As a firm, HK Marble Glass was incorporated in 1972 and dissolved in 1978. Founded in 1957, Koon Wah Mirror is the leading glass manufacturer in Hong Kong and recognized as the “King of Mirrors”. A native of Nam Hoi, Koon Wah founder Hui Hoi (許海1923-2013) came to HK in the 1950s and made his initial fortune in the dealing of hides and skins and metals. Sensing an opportunity in glass, Hui spent $540,000 in 1964 to acquire 10000 sq ft of factory space in To Kwa Wan and built one of the largest glass factories in HK. His timing was perfect and business took off with the construction boom. Soon he realized more money could be made in owning the real estate and started developing industrial properties. In 1972, Hui Hoi acquired two parcels of land in Kwai Chung and Chai Wan for HK$4.3 million and built his first and second Koon Wah Mirror Factory industrial buildings. (First one has been sold in 1988 and renamed Suntex Tower; second one still owned by the family but renamed Reality Tower). In the 1970s he developed the third, fifth and sixth Koon Wah Mirror industrial buildings (fourth was skipped as four is bad luck in Chinese) in Kwai Chung, Kwun Tong and Tuen Mun and built his headquarters Koon Wah Mirror Group Building in Shatin. When Tsim Sha Tsui East was being developed, Hui paid $80 mil for site in 1978 where he built his first office building – Mirror Tower in 1982 and recuperated his investment in less than 3 years. Since the 1990s, the family began accumulating retail space as HK transitioned from an industrial economy to one that is consumption and service driven and over time built a multi-billion dollars portfolio which included a dozen branches from Standard Chartered Bank, 4 prime retail spaces in Park Lane Shoppers’ Boulevard in TST and Trade Square in Cheung Sha Wan. Despite success and generous philanthropy, the family remained very lowkey and frugal. After his death in 2013, Hui Hoi was succeeded by his younger brother Hui Ming (許銘) and his nephews Kevin Hui (許鑑聰)Hui Kam-wa (許鑑華), Hui Kam-tong (許鑑棠) and Hui Kam-wing(許鑑榮). This article was first posted on 20th November 2017. Orient Glass traced its roots to Central Chemical Glass Factory (中央化学玻璃厂), the first manufacturer of chemical glassware (e.g. beakers used in laboratories) in China founded in Shanghai in 1934. Its founder Wang Hsing-sheng (王幸生, 1904-1974) was the son of a Ningbonese merchant in Kobe and his Japanese wife. After graduation from Kwansui Gakuin University in 1932, Wang founded Central with the financial support of his father and leading academics such as Ta Tung University founder and chemist Tsao Hui-chung and the famous educator Tsai Yuan-pei. With the aspirations to become the Pyrex of China, the firm managed to produce high quality glassware which was used by leading firms such as Yung Lee Chemical and was sold throughout China and Southeast Asia. 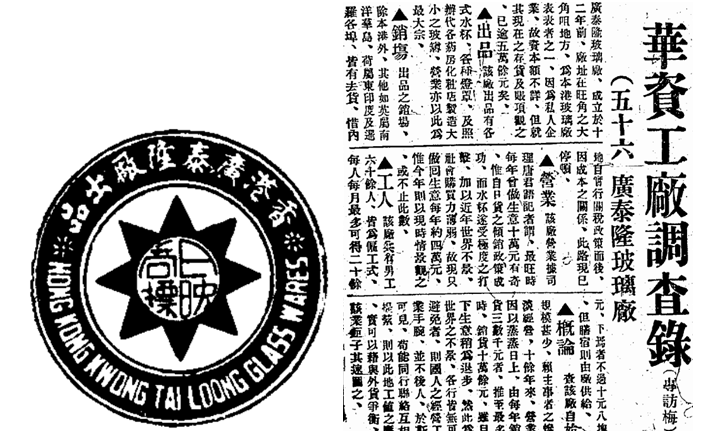 During the War, production was suspended and harassed by KMT government after the War due to his Japanese heritage, Wang relocated to HK in 1945 where he established Orient Glass with Siao Sam-peng covered in the article. When the KMT regime collapsed in 1949, Wang returned to China where he established New China Glass Factory (新中国玻璃厂) in Shenyang in 1950. In 1951, he and his lieutenant Chen Kung-hing (陈公庆) moved the equipment of Orient Glass from HK to Taiyuan in Shanxi province where they established Chung Yuan Glass Factory (中元玻璃厂) at the recommendation of economics czar Chen Yun. Wang died during the Cultural Revolution but New China and Chung Yuan continue to this day.